The clueless gamblers that speculate on stock and commodity prices have been having a field day recently. Desperately chasing profits, like high-rollers who keep increasing their casino bets every time they lose, they have wiped billions out of share and pension values in a lemming-like panic about whether and when the colossally overpriced stock market is going to crash. And they have also pushed the price of oil up to near $70/bbl for the first time in several years. These speculators, who contribute nothing of any value to our economy, are some of the most destructive individuals on the planet, destabilizing markets on which many depend for their lives and livelihoods. (They also wreak havoc on land, real estate, food, and currency prices.) And many of them make millions in commissions and bonuses just rolling the dice for their employers and clients and praying that their lucky bets (mostly on prices rising perpetually) will continue. 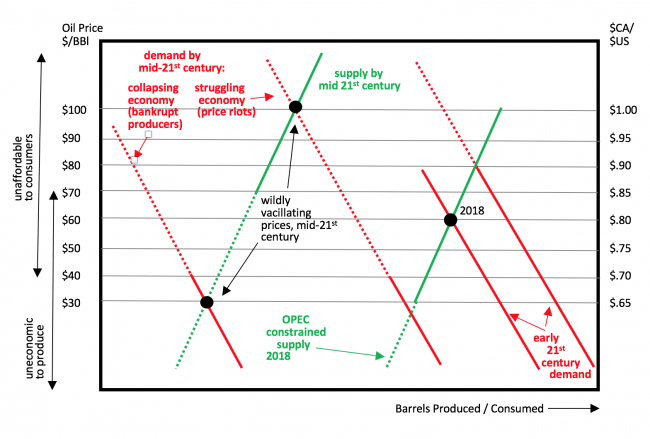 A couple of years ago I wrote an article about the price of oil, explaining that the issue we’re going to face in the 21st century isn’t one of energy running out, but of affordable energy running out. Just as, during great depressions and famines, masses of food is left rotting in the ground because no one can afford to buy it (or even retrieve it and give it away), having oil in the ground that costs $80/bbl to get to market (especially if governments run out of money for subsidies, or, god forbid, decide that oil companies should start to pay the huge external costs of their activities) is not especially useful when you can only afford, in an economy ruined by overexploitation, environmental degradation, excessive debt, inequality and waste, $30/bbl for it. Before I go further, if you’re one of the many who have been persuaded that “peak oil is over” and that renewables and new technology will soon save us from energy collapse, you might as well not read this article. Instead, I’d suggest you read this, or this, or this, or any of the many other articles written by people who understand the laws of thermodynamics and how the economy actually works. 1946-72. Oil prices were remarkably stable at about $25/bbl (in current dollars) during this entire period. 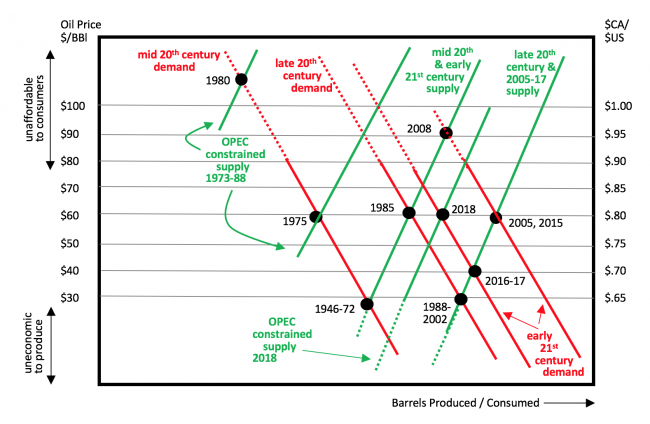 The world became dependent on OPEC. Virtually all global growth in real terms since 1946 is attributable to increasing use of oil. Almost none of it is ascribable to new technology (other than energy extraction technology) or “efficiencies” or “innovation” or “economies of scale”. That’s it. If you’re a believer in GDP or that growth is essential to the economy you might want to keep that in mind (and if you are invested in stocks or land or any other industrial resource, you’d better believe, because their “value” is all computed in terms of future growth in exchange value, production and profits). Between 1946 and 1972 the OPEC nations were in bed with the western corporatists (as they still are today, supporting them politically and militarily), fixing the price of oil at that price to ensure the economy could continue to grow, as required, endlessly. 1973-80. OPEC fights back, realizing that although they can make money at $25/bbl because of the size and ease of tapping their reserves, they have already pumped out more than half of it, and they have only a few decades’ worth left and nothing to support their economy when it runs out. So they constrain production, driving the price up to $60/bbl (1975) and then $110/bbl (1980). At that price they can set money aside for when their oil runs out, and avoid the massive humanitarian crises that the end of oil spells for them. But for the western corporatists, this is disastrous: their economies are in a shambles, with double-digit inflation ruining profits, and line-ups at the pumps. 1981-85. The western corporatists “convince” OPEC to turn the pumps back on, persuading them that there is a happy medium price for oil (more than the $25-30/bbl that makes exploration for new sources uneconomic, but less than the $75/bbl threshold beyond which the global economy cannot pay for it and hence cannot survive. By 1985, OPEC has increased supply so that, despite the new demand from expanding Asian countries, the price has settled back in the perfect $50-60/bbl range. Remember here that the amount of production and consumption of oil is so close (there’s no place to put much excess once it’s pumped, and there’s no margin for error if there’s a serious shortage) that any changes in production, intentional or not, have a huge impact on price. 1986-2002. At $60/bbl, there’s an incentive to put more into the market than you can sustainably continue to produce, and also an incentive to find new sources — and remember, a small increase in supply has a big impact on lowering price. From the late 1980s to 2002, the lingering effects of the early-1980s crash kept demand from increasing as it had been, and a number of (heavily subsidized, environmentally catastrophically damaging) new sources of “dirty” and “tight” (harder to extract) oil were found. As a consequence, prices tumbled back to the $30/bbl level. OPEC was not happy, but some of their own short-term-thinking members were opening the taps to try to bolster their struggling economies, and the new sources meant OPEC as a whole had less oligopoly power over supplies and hence prices. 2003-08. The low prices were unsustainable to many producers, especially those with higher production costs that ceased or curtailed exploring, and that, combined with increasing demand from third-world countries, began pushing prices up again, to $60/bbl in 2005 and $90/bbl in 2008. You remember 2008, the bubble year, right? Over-exuberance had enabled speculators to push the price of everything up to ridiculous levels, and oil was not spared. The crash of 2008 also weakened demand, as many people could not afford to pay for anything, including fuel. But everyone knew the $90/bbl couldn’t last, just as they knew it in 1980. 2009-17. Banking on continuing high oil prices, speculators jumped into fracking and other high-risk, costly (and heavily-subsidized) smaller-scale oil ventures. For the first time, people who can’t think further ahead than the next quarter’s profit report were saying that there was more than enough oil, and that peak oil was dead. More reasoned experts argued that the danger to our planet from climate change caused by burning oil now exceeded the danger of running out of it (we may well experience both in the years to come). But many of the new ventures depended on sustained high oil prices, and as supply rose, price inevitably dropped. This was exacerbated by a chronic global recession that (despite what you might read in the Wall Street press) has left 90% of the population with massively higher debts and less disposable income than they had back in the 1980s. That recession curtailed demand and added to the price slump that saw oil drop from $90/bbl in 2008 to $60/bbl in 2015 and then back to a near-ruinous (for producers) $40/bbl in 2016-17. Many of the new operators declared bankruptcy, but in the mean-time they (and the ongoing recession for all but the super-rich) had created a short-term oil glut. More people came to believe that oil would be abundant forever, at reasonable prices. Many OPEC countries’ governments, already struggling with unruly political movements, and a permanently unemployed youth workforce, were getting antsy. 2018. Surprise, surprise, the oil price has risen again, to as high as $70/bbl, though it seems to be hovering mostly around the ‘ideal’ (for producers and consumers) $60/bbl level. The problem is, that’s not quite as ideal as it used to be. The cost of bringing new oil to market has risen from very low-levels (near $15/bbl in the mid-20th-century OPEC countries, to $45/bbl for much “tight” oil extraction). So a very volatile $50-60/bbl price doesn’t provide much margin for producers in an economy that demands significantly increasing profits every year. And it’s expensive for consumers, who start to reduce consumption and turn to alternative sources of energy (where available) when prices move into that $50-60/bbl range. 2018-2025: Just a guess, but there doesn’t seem to be any compelling short-term trend in supply or demand one way or another, so I’m guessing that we’ll have a few years of relative stability, with prices ranging from $40-80/bbl depending on producer actions, politics, climate change proclivities, carbon taxes and regulations, and the strange whims and misconceptions of speculators (damn I’d like to see a huge speculation tax on every do-nothing transaction gamblers put through). 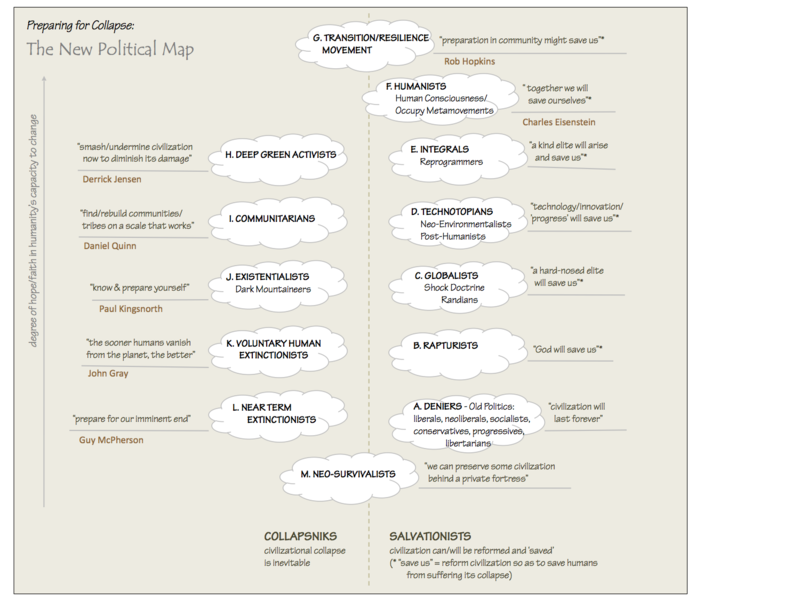 2025-2050: In the medium term, all bets are off. I can see, as conventional sources of oil get depleted and new ones cost more and more, the cost of getting oil to market rising enough that any price under $70/bbl won’t be worth the risk. And I can see, as the real economy (not the economy-of-the-elite the NYT and WSJ reports on) continues to struggle and inequality widens to become a political and even military issue in many parts of the world, the affordable ceiling price for oil dropping to $40/bbl. So that means there is no “happy medium” that works for both producers and consumers — any price is either too low for producers (keeping/driving them out of the market) or too high for consumers (leading to hoarding, involuntary reductions in use (ie repo’d cars and foreclosed homes) — or both. So I see prices whipsawing between $30/bbl or less (when the economy is in especially bad shape) and $100/bbl or more during speculative frenzies, rationing (in black markets), severe shortages and short-lived “is the long depression over yet?” economic recoveries. 2050-2100: This is the period in which I’ve forecast economic and/or energy collapse and the onset of chronic serious climate change trends and events. I don’t think the US dollar will survive this, so it’s hard to set a price on anything in that currency. I do see it as a long era of scavenging, re-use, rationing, nationalization (until national governments collapse and leave energy management to struggling local communities), hoarding, black markets, and yes, even conservation at last. Not a very rosy picture, but those who’ve studied the economy and have been following oil prices for a while tend to support much of this hypothesis. Ultimately, it’s the economy, (not so) stupid. The economy is the tail that wags the energy dog, but ultimately the global industrial economy is founded entirely on the preposterous and untenable requirement that growth must continue forever, and the only thing that has provided sustained growth for the past couple of centuries has been cheap hydrocarbons. And I understand oil doesn’t keep very well. You may have noticed that there is a second Y-axis on the charts above, showing the value of the Canadian dollar relative to the US dollar. Endless studies have shown that the Canadian economy is more robust, and its workers are healthier and more productive, than those in the US. The only reason the Canadian dollar doesn’t trade at a premium to the US dollar is speculative ignorance (and, unfortunately, the degree of ownership and control American corporations have been allowed to acquire over Canadian businesses and resources). Many if not most speculators are Americans, and many of them insist their currency is a safe haven in bad times (they are in for a surprise, but it may take a while). They also believe Canadian production is tied to oil prices, which is why these idiots, who manipulate currency values with their flights of fancy, have essentially priced the Canadian dollar as if it were a petrocurrency. So the Y-axis at right shows, with a remarkably high degree of correlation, the relationship between the price of oil and the value of the Canadian dollar in US dollars (currently almost exactly $.80) dating all the way back to the 1960s. So if you’re a Canadian who spends a significant part of your income in the US or on $US investments, keep an eye on the volatility of the oil market. You can use the Canadian dollar to judge where speculators think the price of oil is going in the near term, or, alternatively, you can use the trends in oil prices to determine when to spend, and not spend, your money on $US purchases. As for me, who loves to winter in warm places that generally use US dollars, I’m at the mercy of the speculators. But if the price of oil goes up, my cost of travel will decline. And if the price of oil goes down, well, I’ll save money in other ways. The ultimate “price” of oil, of course, is the desolation of the planet. I’ve written a lot about that in the past, and until I have something useful to add, I think I’ll leave it at that. I am surprised though of your optimism towards supply continuing undisturbed beyond 2025, because the collapsing ERoEI of both conventional and unconventional oil means the amount of net energy available to complex society will drop rapidly, collapsing the economy. Like a dog chasing its tail in effect. I’ve received a note from Australian Prof Ted Trainer who wrote an article in the journal Energy Policy last July that explains in considerable detail why a switch to renewable energy, even if it were logistically possible (eg a massive, coordinated switch to electric and hydrogen-storage energy for transportation, and major innovations and improvements in the efficiency of renewable technologies), would be utterly affordable. It’s in the context of Australia’s policy needs, but it does deconstruct the arguments of technophiles who think tech and ingenuity can magically overcome all political, economic and logistical realities. Thanks to him for sending me the article and for Paul Heft for passing it on.